Happy accidents happen out of necessity. More specifically, the cravings that come on late at night. This was how this lovely recipe came about. Now since I only had a cup of blueberries, this recipe is for a very small dish. Probably good for two generous servings, four if you’re being stingy. 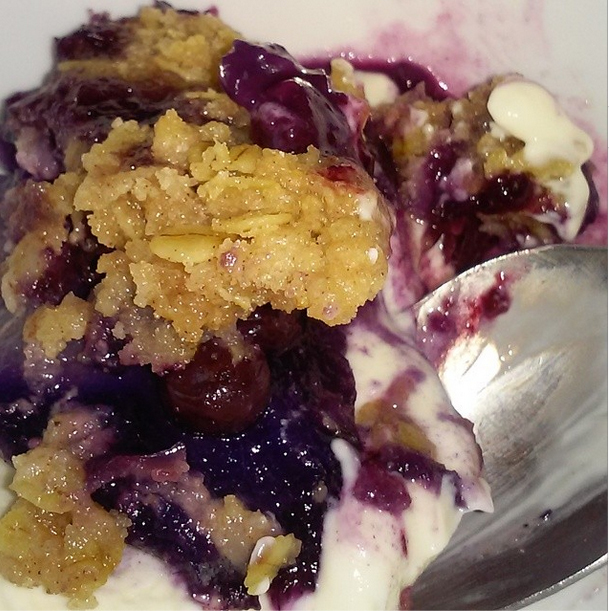 I had half of this crumble minus a few spoonfuls shared with the husband, and the following morning, I had the remainder over Greek yogurt for breakfast (that’s the photo above). There’s no photo right out of the oven, because really, who remembers to take a picture when going through a sugar withdrawal? Fresh blueberries and canned pears make a great combination for this quick and easy dessert. Adjust the proportions according to your taste and number of servings required. In a small oven safe bowl, combine the pears with its juice/syrup with the blueberries. sprinkle with one teaspoon of cornstarch and mix it in. In a separate bowl, combine the remaining ingredients, mixing it with a fork or pastry cutter until the butter is blended into the mixture. Sprinkle over the blueberries and pears. Bake at 350F for 30-45 minutes or until it is bubbly and the crumbs on top are golden. Let it cool for a few minutes before digging in. Great served with ice cream while warm or cold with Greek yogurt. My daughter created an Instagram account where we post what we cook as we’re eating them. So if you want a preview of what recipe may be coming next, follow us at MooreAndMooreFood on Instagram.